Visit Downtown Lewisburg at the Visitors Center to view all of the beautifully decorated Trees, wreaths and table top Décor. Special recognition to the best decorated tree will be the result of the public voting on their favorite tree. 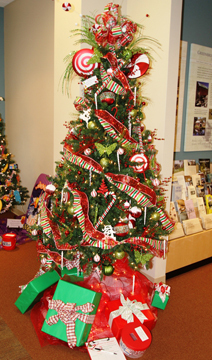 You can vote for your favorite Tree by donating $1.00 per vote! There will be a Silent Auction where all of the items are available for purchase through the Silent Auction. The proceeds of the Silent Auction will benefit United Way of the Greenbrier Valley. Jill Allman designed “Candy Cane Lane” donated by Greenbrier Real Estate Service which displays an array of Red and Green Candy Canes and Striped ribbon. We are happy to be a part of donating to the local United Way of the Greenbrier Valley.